It's a special Monday edition of Worth Reading, thanks to yours truly running out of time on Friday afternoon. But let's kick this week off right by inviting debate on some of the most contentious topic around: frame rates and the price of a video game. These are paragraphs I might otherwise dedicate to celebrating The Legend of Zelda: Majora's Mask on 3DS, but there's been plenty of wonderful coverage about the world of Termina on Kotaku. It's nice to finally work for a publication that appreciates one of the best Zelda games ever made! Majora's Mask, you are finally having your moment. We are having our moment! It's a little weird, though. Majora's Mask, like so many other older games, has gotten a bit crusty over the years. Smartly, Nintendo has done far more than merely update the graphics for Majora's Mask, the company has actually altered the gameplay. That's more effort than we usually see from these updates, but it smartly recognizes the advancement of game design and how those without nostalgia might be prevented from enjoying an otherwise terrific experience. If Majora's Mask had been released with nothing more than tweaked visuals, I don't think as many would have paid attention. Sure, I'd be giving the game another playthrough, but how many others? I'm doubtful. Even if the core of Majora's Mask hasn't changed, the prospect of any changes has likely given others a reason to try and understand Majora's Mask this time. Whatever the reason, I'm happy. Until a few years ago, I only played on consoles. I had a PC growing up, but as an adult, I never got around to building my own. 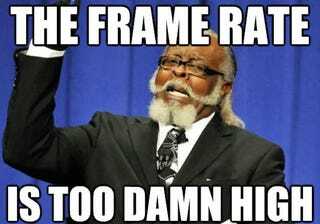 Especially during the waning years of the Xbox 360 and PlayStation 3, as the machines were pushed to new extremes, I got used to regularly crappy frame rates. The frame rate conversation is a heated one, but Gita Jackson invites a new dimension to the debate in her latest piece, in which she criticizes the industry for chasing Hollywood for the wrong reasons and not considering how frame rates can inform design. There are a few points I'd take issue with—people often change field of view to combat nausea—but Jackson outlines plenty of thoughtful observations about gaming's relationship with frame rate. "AAA game developers don't seem to have paid any attention to these conversations. AAA is going to need to choose which framerate would best suit the story they want to tell, but it doesn't look like they've even thought about that. As long as the consumer demands both a high framerate and Hollywood-style storytelling, game developers will continue to try and fail to deliver both, no matter how nonsensical the final product may appear. In the first person-perspective, when you see a lens flare, is the implication that your head is a camera? The world may never know. I think the only way to move past this without seeming like a luddite is to ask how this phenomenon is going to change the way we read the moving image." If there's a more heated conversation in games than frame rate preference, it's the one over value proposition. Games are expensive, so it makes sense people go out of their way to buy them cheap. Look at the response to Valve's regular Steam sales! I've never purchased a key from a shady corner of the Internet, but I can understand how people might find their way there. How did the keys get there, though? Thankfully, Charlie Hall spent some time tracking one particular key. What he finds isn't revelatory or damning, but it's awfully interesting. "Online, he goes by a handle designed to put some distance between his storefront and his real-world identity. We'll call him "R". In reality, he's a young entrepreneur living in Italy. Polygon's key for Gravity Ghost was one of dozens of keys he has up for sale at his page. R told us that he makes between 1,000 and 1,500 Euros in total revenue per month on his store, or between $1,100 and $1,700. During the holidays, he says, that can rise to more than $2,200 per month. We asked if this was his full-time job, to which he responded, "Something like that." We can't really be sure if his store on Kinguin is his primary source of income. From the perspective of consumers, the sale of gray market games makes sense. Sometimes people receive games as gifts, or as promotional offers and either do not want them or do not need them. Promotions like Steam discounts and Humble Bundle sales are timed offers, and invite those with the means to make speculative purchases, investments of a sort, where game keys are farmed with the intention of selling them later for a profit." Austin Walker is one of gaming's smartest critics right now. Help him out! Children of Morta appears to be a roguelike spliced with Hyper Light Drifter. Steel Assault might as well be an abandoned action game from 1992. Tweets That Make You Go "Hmmmm"
Zolani Stewart looked at how Mortal Kombat 4 represented a series with an identity crisis. Jen Doll investigated the lost story of how Monopoly was invented by a woman. Todd Harper took a close look at the decisions, big and small, proposed in Life Is Strange. GB Doc Burford contemplated the often messy balance between story and gameplay. Jeremy Parish discovered newfound confidence in games after watching the Grammys. Tom Hoggis spent time with the growing media empire that is the Yogcast. Patrick Lee advocated for finishing the Professor Layton games. Wesley Yin-Poole tracked down the kid Peter Molyneux promised would become a god. Gary Napper spoke to the developer of Alien: Isolation about its controversial save system. Jon Ronson examined how a single tweet managed to completely derail someone's life.